Wild Winnie Mini ** Finish **! 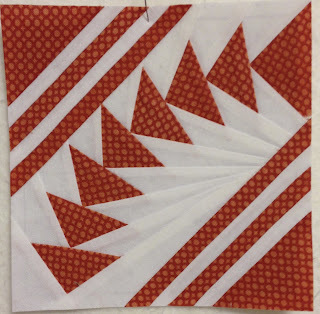 I was browsing an edition of Love Patchwork and Quilting Magazine a little while back and saw a paper pieced block that caught my attention, not sure why but I felt I had to make it. The block was the BOM by Lynne at Lily's Quilts. I started by making just 1 block! I used some fabrics from the collection Juggling Summer By Zen Chic, in orange. It didn't take long to add more blocks to the collection! 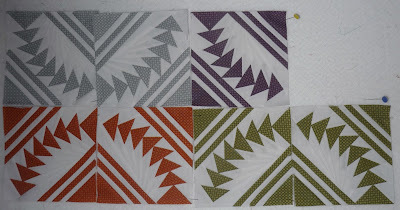 I had the whole range of colours for this collection so kept to the same pattern and just changed the colour. It was at this point that I thought I ought to plan where I was going with this! I decided I had to have 4 blocks of each colour. But I didn't like the way the colours didn't match at the point they joined a different colour. The picture below show how the blocks would have ended up and the bit I didn't like - the multicoloured square in the middle. So I had to make some adjustments to the blocks I had made. 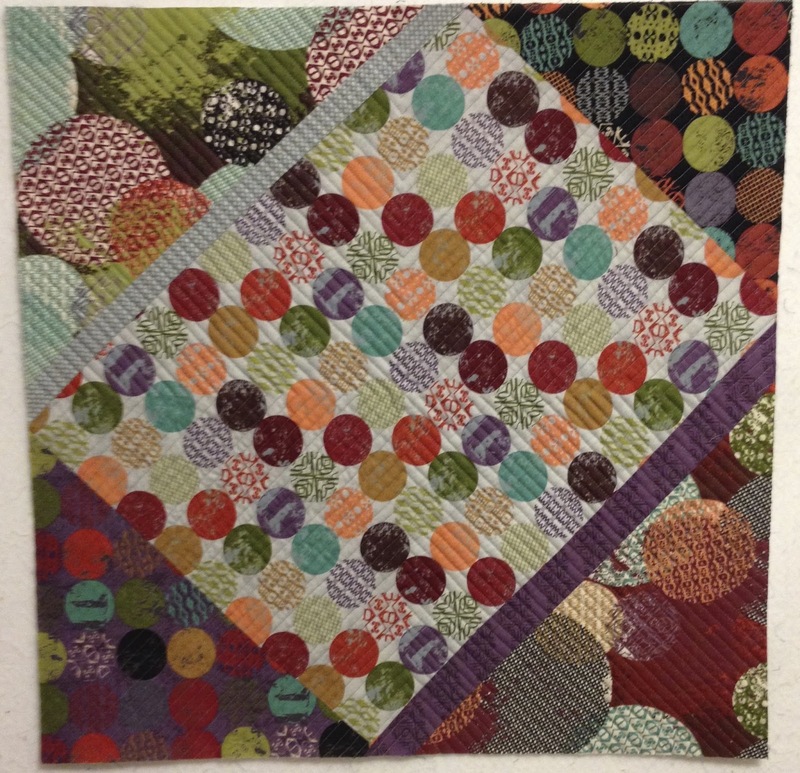 I added another colour, the black, to border the resultant inner square, and another colour. Like in this picture below. The downside of paper piecing is taking the papers off! 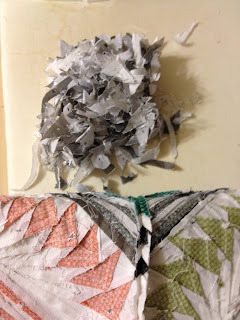 I seem to get in a right mess and have to be careful not to pull the stitches too hard. The back of this mini was a random pull together of some of the other fabrics from the collection. 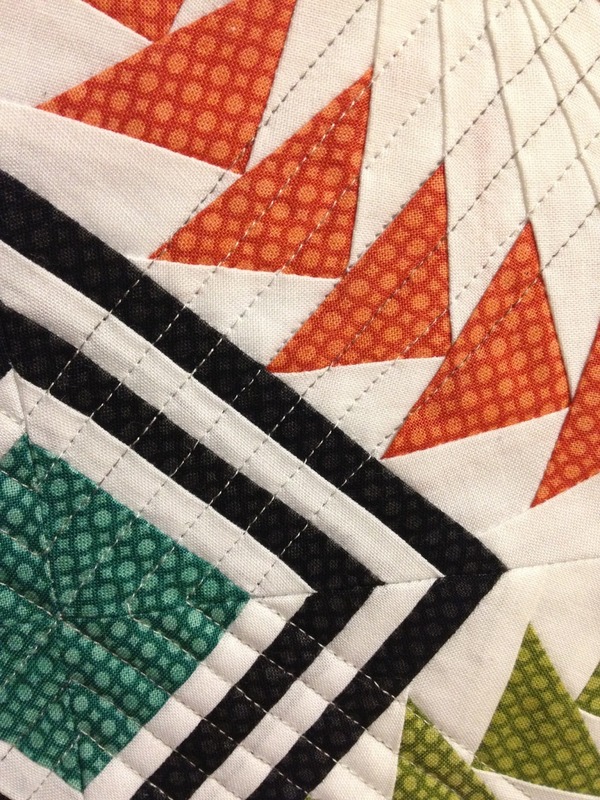 I quilted straight lines 1/4 inch apart using a variegated silver Aurifil 50 wt thread. 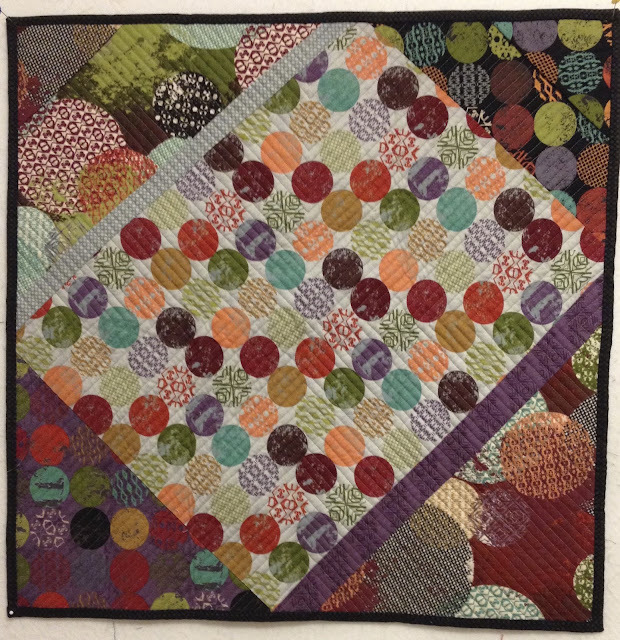 I bound it in the same black fabric as used in the quilt top for continuity. I think it framed it quite nicely. I am really happy with this finish, very bold! Now I just need to find a place to hang it. Having started it last quarter I made it one of this quarter's Finish Along Q2 goals! 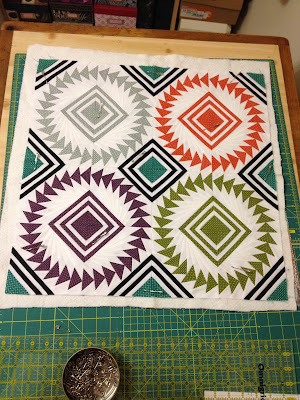 And I succeeded, now I really should tackle one of the more long term WIPs on my list! 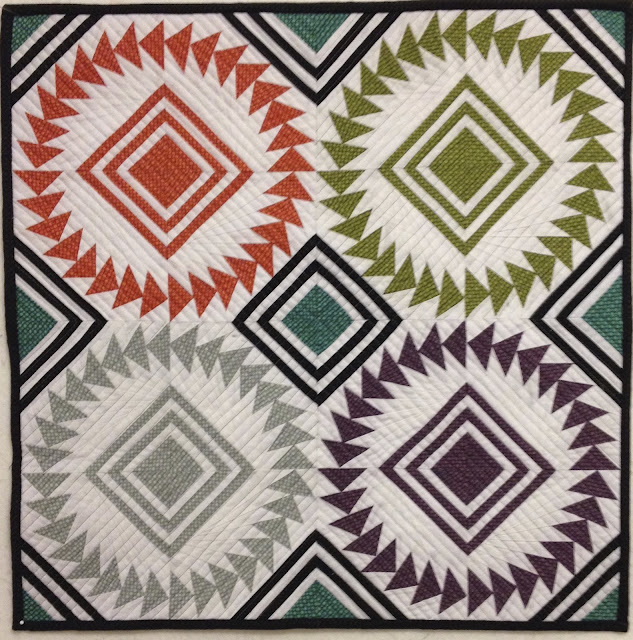 Pattern (front): Wild Winnie block by Lynne at Lily's Quilt. Pattern (back): Thrown together by me using fabrics from the same collection. Fabrics: Juggling Summer by Zen Chic. 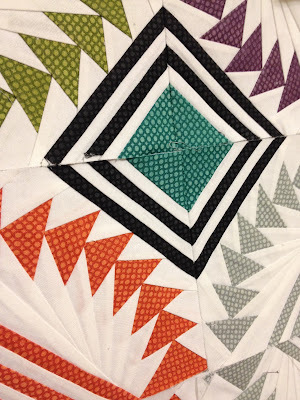 The black really makes it pop, the movement in this quilt is great. Very nice! very nice. I like your progression pictures also. It's interesting to see how it grew to be come the finish it is! 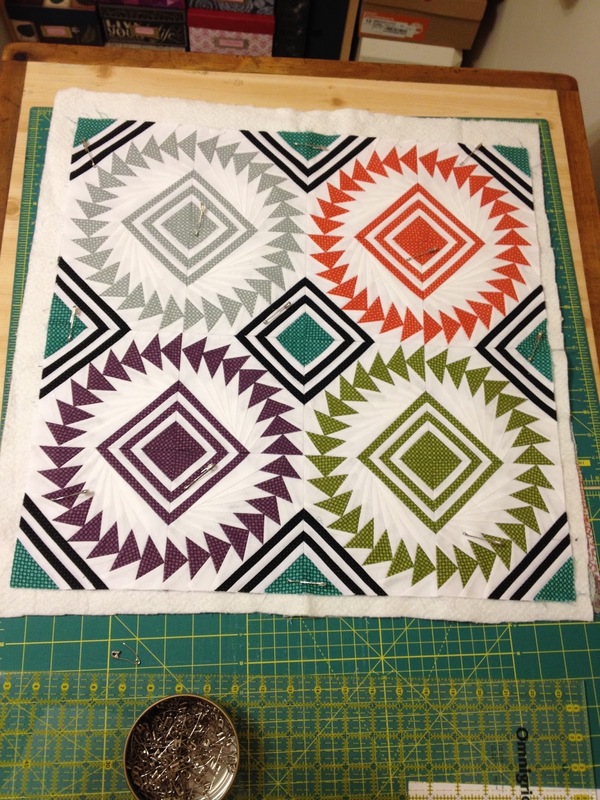 Such a stunning block and I love the colours you have used! I need to go back through my LPQ magazine to have a look at how they are done!